Your baby means everything to you, so you want to be sure he’s receiving optimal nutrition to help him grow. We know breast milk is important to the health and growth of your infant and every drop counts, so you need a safe, effective way to store it for future use. Our experts performed extensive research to bring you a list of the best breast milk storage bags. Before you start shopping, check out the specifications below to help guide your purchase. Pieces: Every mother and child duo has different needs. If you’re a working mom, you may benefit from a set of multiple bags that allow you to store several servings at a time. Check this spec to be sure you end up with the correct storage capacity. Leak Proof: We don’t want to see you lose any of that liquid gold, so make sure if you plan to store the bags on their sides, they’re leak proof. We’ll let you know about each of the options on the list with this specification. BPA Free: In recent years, we learned the chemical BPA, commonly found in plastic, can be harmful. Many baby products today are made without BPA, but check this spec just to be sure, if this is something you’re worried about. Capacity: As your baby grows, so will her appetite. Whether you need 4 oz breast milk storage bags, or your little one is an eating machine, make sure you choose a bag or set of bags that allows you to store the right amount of ounces to keep her satisfied at mealtime. Pour Spout: Cut down on dripping and loss, when you choose a bag with a pour spout. This super convenient option is great for anyone short on time because it cuts down on messes. Check this spec to find out if each bag has a pour spout. Freezer Safe: When you’re away from your baby, it’s great to have frozen milk that the other caregiver can defrost and feed to her. We’ll let you know if each bag or set of bags is freezer safe, so you know your storage options. 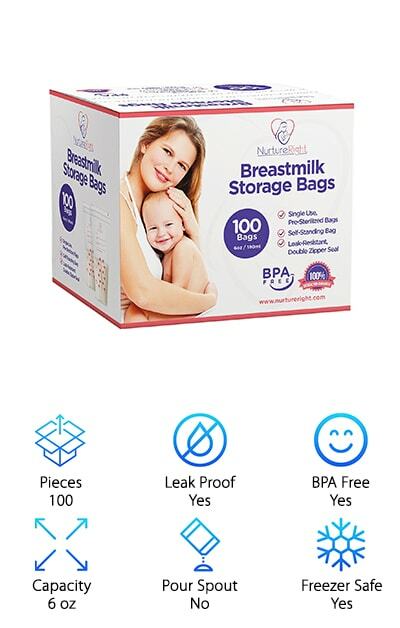 Now that you know what to look for while shopping, you’re ready to check out our breast milk storage bags buying guide. Every option on our list is a durable, safe product, perfect for preserving your breast milk between feedings. If you’re in a hurry, check out our top and budget picks first. Let’s get started! Our top pick for the best breast milk bags is Lansinoh, a baby brand known for quality products. 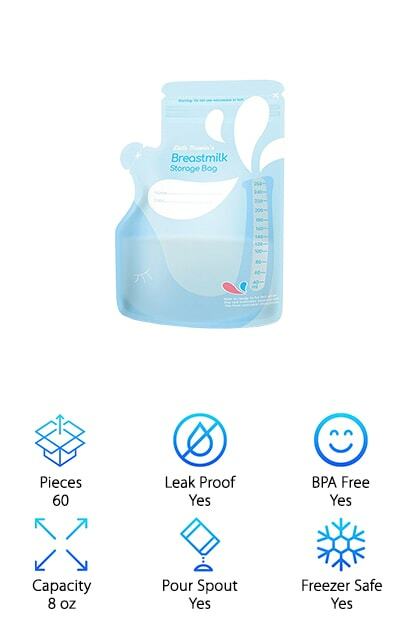 Lansinoh Breastmilk Bags are BPA-free and pre-sterilized, making them convenient for any new mother or mom on-the-go. No need to wash them out or worry about toxic chemicals leaking into your milk. Simply pump directly into the bag, seal it, and store it! Lansinoh sets come in different counts to accommodate every mom. Freeze 100 six-ounce bags of breastmilk to keep your baby eating for days or even weeks, when you choose these efficient bags. A click and secure zipper seal and double-sealed seams make Lansinoh one of the strongest products on the market and ensure your milk won’t leak, even if the bag slides onto its side. In fact, these bags are designed with efficient storage in mind. They can lay flat to make space or stand upright. And when it’s time to transfer the milk to a bottle, the convenient pour spout keeps drips at bay. 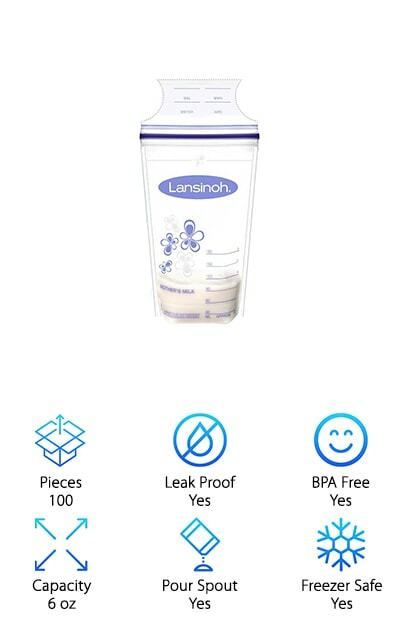 Trusted by breastfeeding mothers for decades, Lansinoh is an ideal way to store your milk. 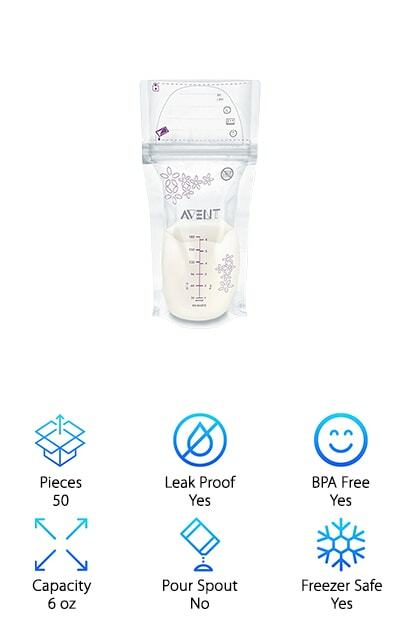 Landing the list as our budget pick for the best breastmilk storage bags are the Philips AVENT Storage Bags. These durable bags are designed a little bit thicker than most of their competitors, which allows them to self-stand easily without tipping for storage in the refrigerator or freezer. A secure double zipper, reinforced seams, and double-bag design keeps them from spilling or leaking, so you don’t have to worry about losing the milk that means so much to your precious baby. AVENT is a well-known baby brand that offers top products for a fraction of the cost of other brands in its class. The bags are BPA-free and designed with a wide opening for easy filling and pouring. They come pre-sterilized and feature a tamper evident seal, so you can always be sure that baby is receiving safe milk. Affordable, efficient, and durable, we know you’ll love having our budget pick bags on hand to keep your milk fresh for baby. 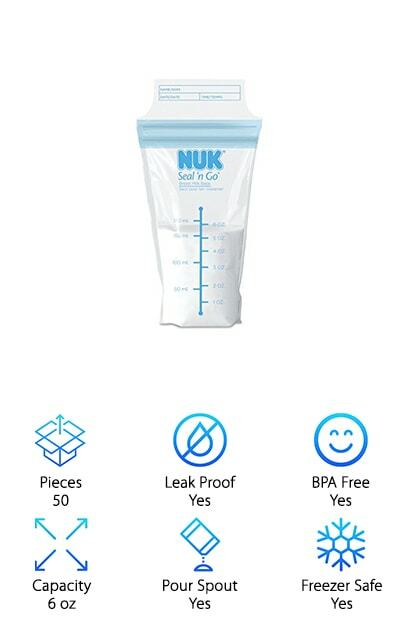 We searched for the top breast milk storage bags, so it’s no surprise we have well-known and trusted NUK Breast Milk Bags on our list. Designed for easy and convenient storage, these bags are equipped with an improved oxygen barrier for freshness, so they can withstand time in the freezer. Refrigerate, freeze, or bring milk on the go with the intelligent NUK design. Double zippers and a gusset-free bottom prevent spilling and leaking from the top and also the corners at the bottom of the bags, protecting you from unnecessary messes. The extra wide seal features a gravity-fed pour spout to simplify filling and pouring. Speaking of filling, you’ll enjoy easy-to-read fill lines up to six ounces. And these bags are pre-sterilized and BPA-free, so you can feel good about keeping your little one safe from harmful bacteria and harsh chemicals. A tamper-evident safety seal ensures freshness every time and the self-standing design frees up room in your freezer for more bags or other food. 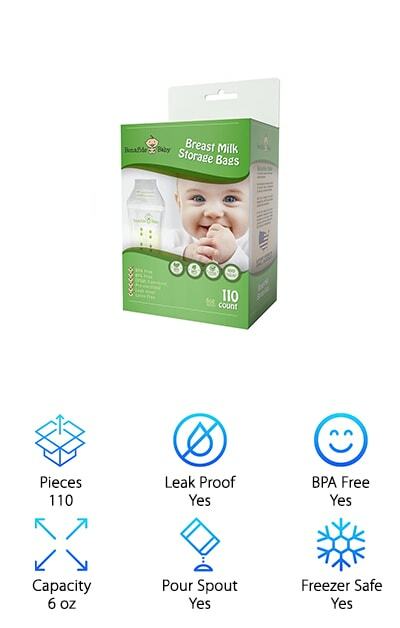 Committed to helping mothers successfully breastfeed their babies, Medela is a popular brand that delivers quality breastfeeding products, so it was a given that their breastmilk bags would end up on our list. 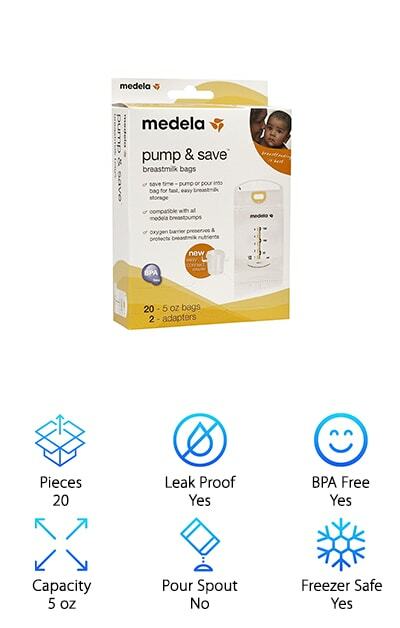 If you’re already a fan of Medela and you’re looking for breast milk storage bags that attach to pump equipment, then look no further. These bags are compatible with all Medela breast pumps, saving you time by allowing you to express milk directly into a storage pouch. They’re equipped with an oxygen barrier that helps to preserve the nutrients in breastmilk and keep it fresh, even if it’s been in the freezer. The leak-proof zipper top and self-stand design make for easy storage and prevent spills and messes. Manufactured with BPA, you’ll receive twenty quality, safe five-ounce bags when you choose Medela for you and your precious bundle. If your baby is older, he’s probably eating more during feedings and you’re searching for large breast milk storage bags to accommodate demand. You’re in luck! You can get a pack of 110 bags that store eight ounces each with Mommy’s Precious Breastmilk Bags. And it only gets better! These bags are leak-proof and designed to self-stand or lay flat for ultimate space-saving. They’re BPA and phthalate-free to keep baby safe from harsh chemicals and they’re pre-sterilized. Designed by parents with other parents in mind, you’ll love the benefits of these convenient bags. Spend more time bonding with your babe and less time worrying about spills, messes, and opening multiple bags for one feeding, thanks to the spacious design. When it’s time to move beyond just a few ounces, it’s time for a storage bag that meets yours and your sweet baby’s needs. The search continues for top rated breast milk storage bags, bringing us to Nurture Right. Backed by stellar reviews, these popular bags are odor-free and made from non-toxic, pre-sterilized material. No need to worry about BPA or even latex allergies, because Nurture Right is designed with every baby in mind. Made to be leak-proof, a strong double seal protects milk from spilling and freezer burn. You’ll never worry about spoiled milk or opening the refrigerator door to a mess, thanks to this grade-A model. The thick material allows Nurture Right to self-stand and also keeps milk fresh during the thawing process. And get this: you can also lay these small breast milk storage bags flat for extra room in the freezer! You have a lot on your plate, so you’ll appreciate the convenience and simplicity of these bags, which are sold in a pack of 100 to give you plenty of time in between ordering. You’re looking for the best breast milk storage bags for freezer storage, which is why we included Dr. DUDU on our list. Sold as a set of 120 bags, you won’t compromise a thing when you choose these 6-ounce packs. Made with a patented zipper design for extra security and sealing, leaks and spills won’t stand a chance. The self-standing base is easy to place in the refrigerator or freezer and double-sealed for extra protection against messes. An easy-pour spout at the bottom of the bag preserves milk when you’re pouring it into a bottle, so you don’t lose drips or drops. You might be wondering how safe these bags are, compared to better known brands. The answer is: extremely. 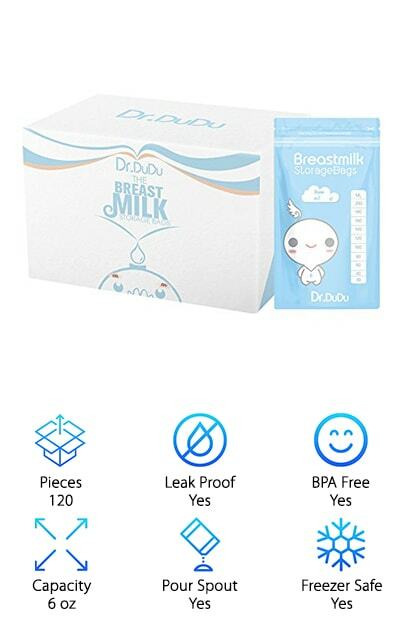 Dr. DUDU manufactures its breastmilk bags without BPA, PEL, and LLDPE to ensure that your little one isn’t exposed to potentially harmful chemicals through her food. If you’re hunting for the best for your favorite little person, then look no further, because you found it! Your love for your baby comes naturally, so why not give him his dinner out of natural and safe containers? We think Bonafide Baby is a top contender for the best breastmilk storage system, which is why we’ve included this non-toxic, BPA-free, and CPSIA compliant brand on our list. Designed with superior leak protection, you won’t waste time worrying about messes in the freezer or refrigerator. Milk stays fresh, thanks to a double zip seal that protects against freezer burn and contamination and you can store the bags upright or on their sides. A perforated tear-off top makes opening easy and also ensures that the milk hasn’t been tampered with. Sold as a set of 110, the bags are pre-sterilized for protection against harmful bacteria. The easy-pour spout features notches on both sides of the opening, making pouring milk into a bottle simple and effortless. Simply fill the bag, store it appropriately, and use it when you’re ready. Life’s complicated enough. Make mealtime with your favorite person easy. 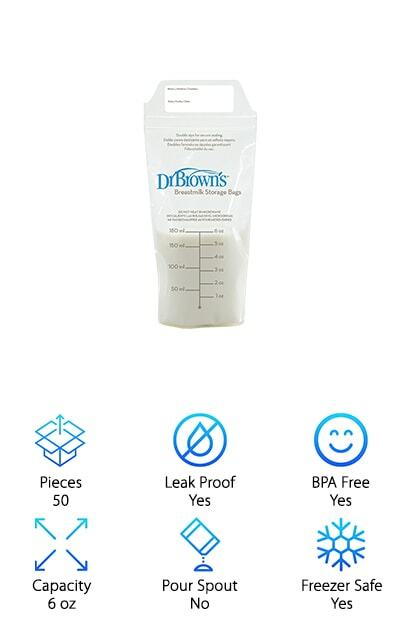 Dr. Brown’s is a leading name in the world of baby care, so it’s no surprise this company makes our list for the best breast milk storage bags. Designed to be extra thick and equipped with a double seal, you’ll know your precious breastmilk is fresh when it’s time to feed your baby. Gusseted bottoms make these bags self-standing and easy to store and a perforated tear-off top makes serving simple. Simplicity is key, especially when you have a new baby or you’ve added to your family. Safety is key, too, which is why Dr. Brown bags are BPA-free and pre-sterilized to protect against potentially harmful bacteria infiltrating milk. Even better, you can easily make the name and date on the bags with a marker, so you’re always sure baby gets safe, healthy milk. A well-known, trusted, and popular brand, Dr. Brown’s will surely leave you satisfied when you’re in the market for infant feeding products. We finish strong with Little Martin’s Breast Milk Bags, an odor-free, transparent, and convenient option, perfect for any parent on-the-go. These bags are easy to use and feature both a spout for mess-free pouring and a wide top, so you can choose how you fill baby’s bottles. Ideal for freezing and heating, these bags do it all to keep mealtime simple. The pouches are double-sealed for extra security, keeping leaking and spills at bay and providing peace of mind that your little one is always getting a fresh, safe meal. Speaking of, a colored indicator lets you know when milk is ready to consume, so you won’t waste time guessing. And get this: these versatile bags can stand upright or lay flat, depending on your storage needs. 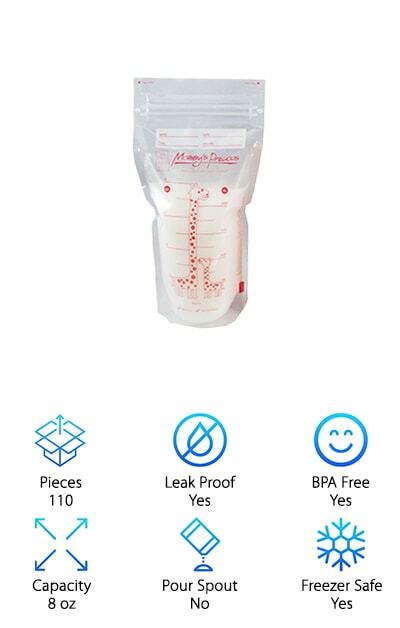 Pre-sterilized to prevent your little one from being exposed to harmful bacteria, non-toxic, environmentally-friendly, and BPA-free, you and baby enjoy the best of the best when you choose these premium breastmilk bags.